TV coupler wall plate that requires no soldering, simply plug your aerial lead into the front and / or rear of the faceplate outlet. 1 x TV coupler plug and play single gang wall plate, requires no soldering, simply plug your aerial lead into the front or rear of the faceplate outlet. 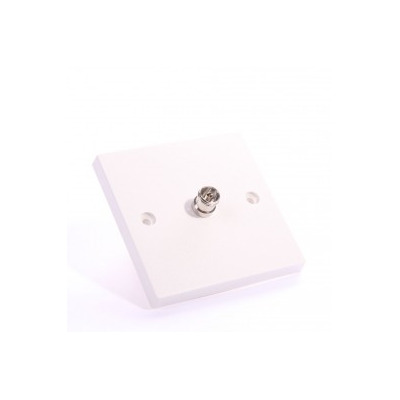 This high quality 86mm x 86mm white television wall outlet has one TV socket coupler on the front and back of the wall plate and fits a standard UK back box. Euronetwork manufacture and assemble euro modules and wall faceplate outlets on site in the UK, if you cannot find the combination you require or would like bulk pricing please contact our sales team on 01908371909 or alternatively email us at sales@euronetwork.co.uk.